Here in Australia the Summer Solstice (winter in northern hemisphere) falls on 22nd December, 2014 at 10:09 am AEDT. At this time, the Sun enters Capricorn, sign of spiritual discipleship, a few days before the Christmas Festival. This solstice chart serves to highlight the planetary energies at play over the next three months. On the 22nd December four planets fall in the Capricorn, creating a powerful focus. Within this chart, cast for Australia, the Sun, Mercury, Pluto and Venus all fall in the 11th house indicated that the social fabric of our society is under great pressure. Capricorn is traditionally considered to be a conservative sign. Here in Australia we have a conservative, some would say the most repressive government since Menzies, in power. The Capricorn Stellium indicates that the weight of public opinion and the government favours a hardline, conservative approach. However, viewing Capricorn through an esoteric lens, we realize that as a nation we have an opportunity to learn certain national lessons and come to identify and promulgate a compassionate, inclusive society which takes care of its most vulnerable members. The next three months offers opportunities nationally and globally to progress in raising the consciousness and therefore Light on earth. A comparison of the Australian chart (created at Federation) and this Summer Solstice chart reveals a few issues, aspects of our national psyche which need to be addressed. 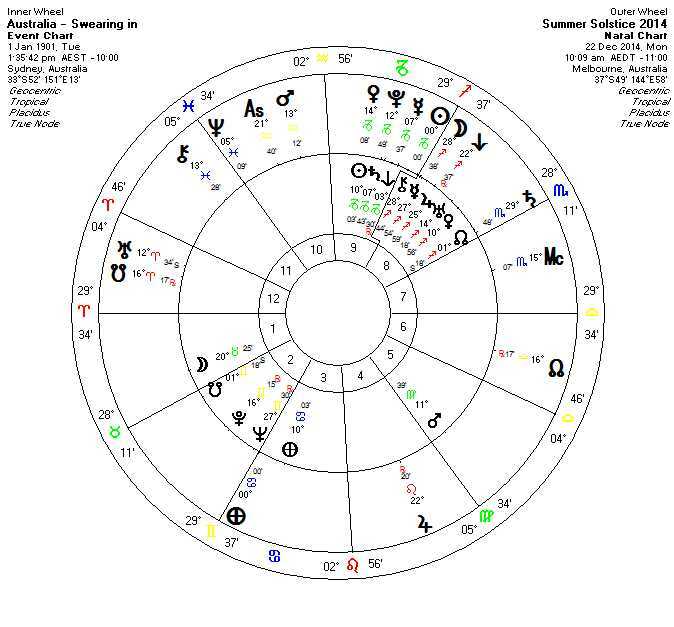 Mercury in the Solstice chart, falls conjunct Australia’s Saturn n Capricorn revealing that significant decisions impacting the national identity and national economy are prominent at this time. Australia has recently legislated the most draconian immigration policy, effectively overturning our previous commitment as a signatory of the United Nations Refugee Convention. This document, drawn up after the second world war, was a global attempt to ensure that never again would people fleeing persecution be homeless and stateless. Australia now stands condemned on the world stage with other repressive nations such as Zimbabwe, for violating this agreement. This decision was taken with barely a whimper from the government or opposition parties with the exception of the lone courageous voice of Senator Scott Ludlam, representing the Australian Greens. By turning our backs on people fleeing persecution we will bring to our shores, national karma. Our failure to legislate compassionately will come back to impact all Australians in the months and years ahead. 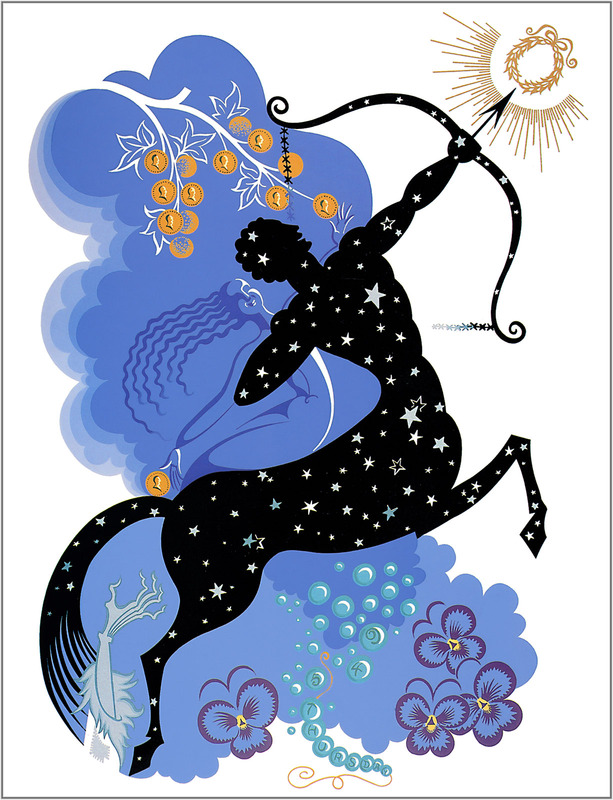 The Solstice chart has the Moon at the end of Sagittarius, it its Balsamic phase, falling exactly conjunct Australia’s Chiron – our Achilles Heel. The Balsamic moon phase indicates that many unresolved matters need to be completed or tidied up over the next three months. When the Moon conjuncts Chiron it is human nature to revert to old habits, even in the face of increased suffering and pain. We can expect that the national shadow, which includes bigotry and racism harking back to the White Australia policy, will attempt to maintain its dominance. It is human nature to fear what we don’t understand. On a personal level Sagittarius governs the global conflict of refugees fleeing persecution from warzones on many continents. On an esoteric level Sagittarius invites us to embrace the difference we find in each other, be it through race, religion or nationality. Effectively we are charged with the need to find harmonious solutions to global conflicts. Many Australians have an immigrant or convict heritage, not unlike those we now drive from our shores. Australia’s inability to maintain an open-hearted policy to the waves of asylum seekers arriving on our shores stands in stark contrast to our perceived national identity of giving others a “fair go”. Our government policies are heartless and cruel – we lock up children indefinitely in detention centres and deport people back into wartorn region – all in the name of our version of persecution. Our inability to look beyond self interest, xenophobia or fiscal national interest stands in stark contrast to our view of ourselves as a tolerant, inclusive just society. Not only have we failed in our lofty goals of embracing multi-culturalism, but we continue to fail in our karmic obligations to the first nation people of this country. Our efforts to close the yawning gap which exists between aboriginal people and other Australians around health, education, work opportunities, housing etc is a deep stain on our national identity and thus our national karma. Currently Saturn is completing its transit of Scorpio, which commenced 2 years ago in October 2012. For the last two years, everyone on earth has been tested in their ability to rise above personal and national interests in favour of what unites us as humans and citizens of earth. Issues of global warming and climate change have been on the world stage – yet solutions which unite the 1st and 3rd world countries remain out of reach. We have seen the rise and rise of fundamentalism and thus far have failed to find a united solution to these issues, one which refuses to demonize one race, nation or religion. We have also failed to redeem our collective human shadow on global matters such as the persecution of women and minorities and the spread of virulent diseases like Ebola and Aids in third world countries. Out of sight and out of mind and profit before people seems to be the order of the day in many corners of the world. Wealthy corporations and plutocracies continue their stranglehold over the masses via food, water, seeds, agriculture, telecommunications, resources, currency and power supplies. Governments have become the pawns of these people and organizations. As Saturn leaves the degrees associated with cruelty (27 – 30 degrees Scorpio) on Christmas Eve, our inhumanity to mankind is being written in stone; recorded on our collective karmic debit sheet. Such a debt will be paid by all. In the Australian chart Aries rises in the last degree; Saturn is now inconjunct this Aries Ascendant indicating that significant dis-ease exists within the national psyche. This disease – lack of harmony between body, mind and spirit – has taken us off course from our soul growth. Within our national chart, the Sagittarian Stellium indicating that a significant aspect of our national soul growth can be attained through education and equality between the sexes. Recently our government attempted to reverse the liberating educational policies put in place in the 1970’sand reinstate education as a privilege of the wealthy. On its own this educational policy would send Australia back to the dark ages by legislating education as the prerogative of the privileged and wealthy few. Limited by the crippling debt associated with gaining higher education, a whole generation of Australians would be condemned to a life of less opportunity for advancement than their parents. We cannot allow this to happen. The inconjunct between Saturn and Australia’s Aries rising also indicates that the imbalance seen within our national psyche is also reflected in our land. Drought reaches out its tentacles to cover the majority of land across most states and territories. How much longer will it be before our farmers can no longer feed the population? Australia’s major rivers systems like the Murray-Darling are under threat; wild weather events have become the new norm in many part of this country. The land itself is crying. In Queensland the Great Barrier Reef, one of the international treasures of the earth and listed as a World Heritage site; is now being raped and plundered for profit, by powerful mining interests, with the tacit agreement of the Queensland Government. Signs of hope can be seen appearing across the world, however these signs are not reported by conventional media channels. Mars in Aquarius forms a wonderful trine to the North Node in Libra indicating that small heart-felt communities worldwide are creating new networks sharing food, education, resources and housing. Children of the New Civilization are working to create and implement technologies which harness resources such as wind and sun, for the benefit of all. Gradually the plutocracies and billion dollar corporations will fail to be replaced by new communities built upon principles of inclusiveness and sharing; a society which respects the earth and works in harmony with the first nation people of all continents. 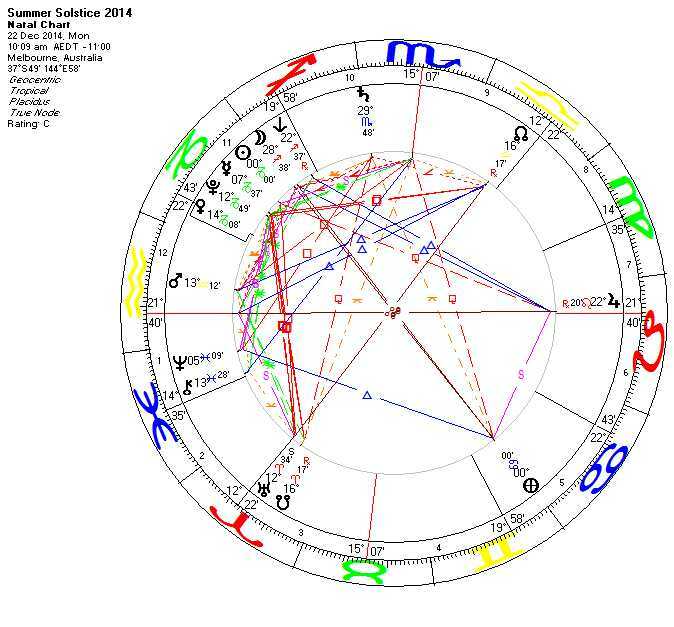 Venus and Pluto form a close conjunction in Capricorn squaring the Nodal Axis in the Solstice chart. Look for the new leaders of the new societies to take their stand; people of integrity and principle; young women like Malala Yousafzai from Pakistan, who is championing the right of education for women in her country. Leaders like Malala are slowly emerging onto the world stage; they represent the new humanity and the new earth which will emerge over time. Venus, which brings the Light of Truth to the world, struggles to override the tendency in all of us to deny and repress (Pluto) that which we find uncomfortable. If we could all look within our hearts and find the truth we have previously denied about ourselves, then Light would triumph. If each of us could find the courage to heal ourselves and hold the Light aloft for a cause or project dear to our hearts, then the Light on earth would shine more brightly. Transiting Jupiter in Leo within the Solstice chart forms beautiful trines to Australia’s natal Jupiter, Mercury and Chiron in Sagittarius. We are capable of rising to the challenges 2015 will bring, if we remember to look to the horizon and find a goal or vision worthy of our nation. When we create walls of protection and defence through self-interest, apathy or fear, we lose our vision and thus our heart. Australia has a destiny to become a doorway into the western world for the entrance of greater love and compassion. It is up to all of us to be the change we wish to see in our country; to lift our voices in protest and proclaim on behalf of those who have no voice. Through the lifting of our vision and raising our voices in the name of Liberty, we inspire ourselves and others to persist in the face of darkness and evil. Through such actions we will once again be able to stand tall and proud of being Australians. This challenge lies before us and our nation. Inherent within this Solstice chart are core issues associated with the ongoing square between Uranus and Pluto. Read Birth of Loving Kindness for some understanding of this subject.